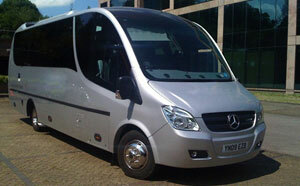 Dans Minibus Hire is also a company that supplies both seven seat and eight seater minibuses with tail lifts on rent. This company also owns a wide range of minibuses including sixteen and nineteen seat minibuses for hire and it is also capable of supplying larger coaches for those who want to travel in a very large group. Dans Minibus supplies a high quality sixteen seat minibus on hire which is very spacious, has excellent interiors and each seat on the minibus has its own safety belt. This minibus is a very popular option for all kinds of group transportation services including airport transfers as well as to visit Royal Ascot. The minibus has an arm rest on each seat , tables, drinks facilities and an excellent sound system. Dans minibus can also supply the larger nineteen seat minibus on hire for those who want to travel in a slightly larger group. This minibus, an Optare Soroco is a new addition to the company’s fleet and is beautifully crafted and in fact, this Mercedes Benz executive minibus is built and designed to provide the most comfortable ride for a group of nineteen passengers. The Optare Soroco is a very stylish nineteen seat minibus with very high quality interiors and is the perfect option for those who need something for prestige operations. This minibus is fitted with luxury high back seats with safety belts, a high capacity roof mounted Diavia air conditioning system that keeps things cool inside and it also has radio/CD player, a public announcement system as well as a hand microphone installed inside. The company is fully capable of supplying the best quality corporate minibus hire services and also caters to the needs of VIP travel for up to 7 persons. Dans Minibus Hire realises that to survive in a very competitive market it must be capable of supplying high quality minibuses and the very best customer service.This realisation has compelled Dans Minibus Hire to provide solutions that meet all the high expectations that customers demand. It therefore treats each customer with flexibility, meets deadlines and handles each customer requirement in an efficient and professional manner. The company’s offices are located in a prime spot just outside the central parts of London and in a place called Royal Forest Coach House. To contact this minibus hire company, you will need to visit Royal Forest Coach House, 109 Maybank Road, South Woodford, London E18 1EJ. Alternatively, you can also contact the company on the phone by dialling 0800 0680 197 (free phone) or 020 8505 8833.